Our systems have detected that you appear to be viewing this site from United States. We are geared up to offer you a far better service from our USA site. You can choose to Continue to USA site or Stay on UK site. 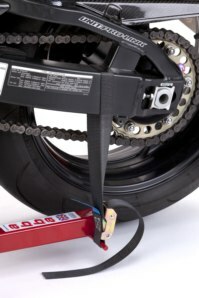 What bikes do our Stands and Lifts fit? abba Sky Lift gallery images. What bikes does our Technicians kit fit? 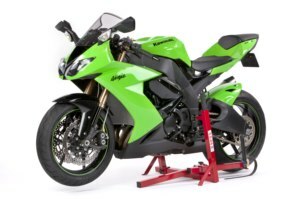 Removing your swing arm? 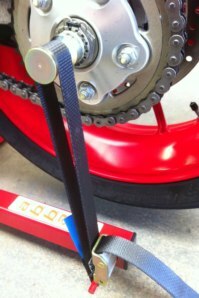 It's safe and simple with the swing arm removal kit..
Make your abba Superbike Stand manoeuvrable by using the Moto Glide. Keep your tools, nuts and bolts close by when working on your bike.. Already own a Sky Lift? 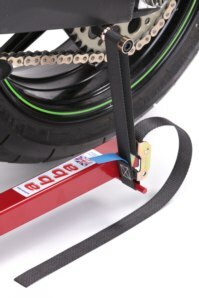 Upgrade your lift to foot pedal operation..
Elevate both wheels from the floor whilst also being fully manoeuvrable..
Keep your Superbike package 2 neat and secure on the wall..
A supreme high quality ground anchor for ultimate motorcycle security.. Select your Bike Model below to see if you need a fitting kit/adapter. Choose a quantity and click the Add to Basket button. 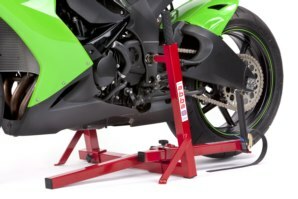 If you are looking for a set of stands to raise both wheels from the ground that can easily and safely be used on your own, allow full maintenance, keep your pride and joy safe, are upgradable for future bikes and above all else will not break the bank then look no further then the abba Superbike Package 2! With all the features of the award winning Superbike Stand and Front Lift Arm combined together at this discounted price its easy to see why the abba superbike package 2 is by far our most popular selling package. abba Superbike Stand - Full product details here. abba Front Lift Arm - Full product details here. These products together usually retail at £141.90 if brought separately, or £152.90 with additional fitting kit. So you save £10.00 with this package. Some models that require a special stand/fitting kit may be extra. Product Protected under UK patent laws. "These stands are a real must, even if you only use the stand to hold the bike upright for cleaning it's worth the money." "Easy to use alone and your bike won't fall off it." "Raise your bike with confidence. abba Superbike Stand lets you work on your bike without the fear of a fairing-crunching accident." "This is a major boom, the main advantage of the abba over paddock stands was it's ease of use. One weedy person could easily and safely haul a heavy bike onto the stand. A paddock stand would have been a far trickier proposition." Combines the abba Superbike Stand and abba Front Lift Arm. You save £10.00 with this package. Everything you need to get both wheels off the ground. Simple, quick one person operation. No modifications needed to your bike. 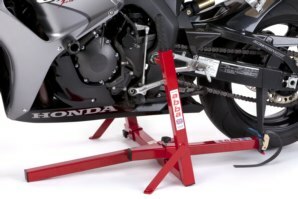 Extremely compact when not in use, can be hung on the wall and will take up far less space than any other front and rear motorcycle stand. Perfect for all cleaning, winter storage and maintenance tasks. Out of the box and fitted to your bike within minutes. Demonstration of the abba Superbike Stand and Front Lift Arm. Being fitted to Honda Fireblade. The abba superbike stand shown being fitted to a Yamaha R1. A detailed video showing how to assemble and operate the abba superbike stand. Viewing records 1 to 5 of 33. This is the greatest stand money can buy. I love this stand so much I can't even begin to tell you. The fact you can buy this stand once and use it for life with all your bikes simply by buying an inexpensive pin kit for your new bike is brilliant. 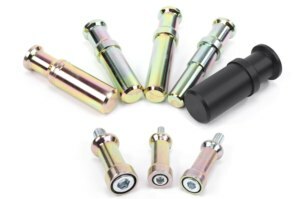 I got the front lift kit as well which easily attaches to the swingarm spools that came with my bike and I can get both wheels off the ground quite easily if I need to. I've had bikes with center stands before and this stand is far more sturdy than even a stock center stand. No balancing acts, no worry about your bike falling. I can put my bike on the stand and leave it for as long as I want without having to check on it which I would do before with traditional paddock stands. Definitely the best accessory I've ever purchased for motorcycling. I adjusted my rear shock the other day while on the stand hammering away on my spanner punch without so much as a wobble. Try that with a paddock stand and see if you feel safe. If you don't have this stand buy it now. Wow!! what a great product.... First of all the service i received was excellent, the product was delivered the next working day and it was well packaged. The instructions are pretty clear, although the stand is very easy to put together and i had my bike mounted on it pretty much within minutes of unpacking. Excellent product, excellent service, great price. 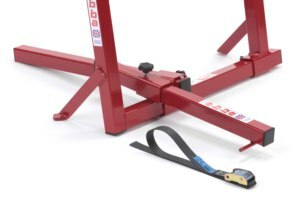 Would highly recommend to anyone looking for a method of lifting both wheels off the ground on a stable stand. This is the best piece of bike kit i've bought in the past 30 years and makes me wonder why i've been messing around with paddock stands all this time, First use was to ajust the head set bearings which was made easy as the front wheel was free of a stand and i could rotate the steering lock to lock, i could go on singing it's praises but instead i'll just repeat THIS IS THE BEST PIECE OF BIKE KIT I'VE BOUGHT IN THE LAST 30 YEARS!!!!!!!!!!! After struggling with paddock stands for the last 20 years, I bought a Superbike stand and Front Lift Arm. What a revelation it has been! Good instructions, simple to fit to the bike, single handed lifting whilst standing upright and a bazillion times safer than using paddock stands by yourself!!! Used in conjunction with the Front Lift Arm to change steering head bearings, brilliant, follow the instructions and you can't go wrong. Would recommend both products to everybody! How do I Know if the package fits my bike? Use our drop down list above to select the correct fitting kit for your bike. If available for your machine you will also be given the option to purchase a Bobbin Adapter or Hub Spindle should you need one. If you don't see your bike listed we may still be able to help you. Use the "ask us" form for more info. Can I see more information on these two products? You certainly can! Full details of both these products can be seen on the individual Superbike stand Page & Front Lift Arm page. 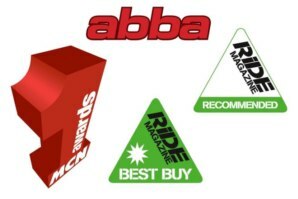 Does the abba Superbike Package 2 come with a guarantee? Absolutely! As with all abba products, and to give you complete peace of mind, we offer a full 3 year guarantee. We aim to dispatch all orders placed before 2pm the same day. All orders are dispatched on a next day delivery service (Not including weekends or bank holidays) For full delivery information please see our delivery information page. Can I purchase this product from your shop in South Woodham Ferrers, Essex? You certainly can. We would advise you call us before coming to ensure we have the product in stock. Got a Question about the abba Superbike Package 2? If you would like to ask us a question about the abba Superbike Package 2, simply fill in the form below and we will contact you within two working days. For a faster response, during office hours, please phone 01245 322 331. Please note fields marked with * are required. Want to tell a friend about the abba Superbike Package 2? You can use the Social Links above (Facebook, Twitter, Google Plus) to share this page with your social network of friends. Alternatively fill in the form below and we will send an email on your behalf to your friend, with a link to this page all about the abba Superbike Package 2. Tip: You can drag this scroller! 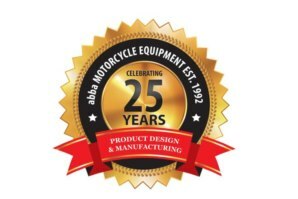 abba Motorcycle Equipment UK Ltd. Terms & Conditions for using our web site can be found here. © Abba Motorcycle Equipment 2001-2019. Our secure online shopping system is powered by WorldPay. Follow Abba Stands on Facebook for product news, promotions and offers. See Abba Stands Twitter Feed for product news, promotions and offers. See promotional and instruction videos of our products on the Abba Stands You Tube Channel.